“We found striking differences between the healthy cells and the ALS cells, and we’ve been able to show the effects of two drugs that are in clinical trials right now,” says Roger Kamm, the Cecil and Ida Green Distinguished Professor of Mechanical and Biological Engineering at MIT and the senior author of the study. MIT postdoc Tatsuya Osaki is the lead author of the paper, which appears in the Oct. 10 issue of Science Advances. Sebastien Uzel, a former MIT graduate student, is also an author of the paper. In the 2016 version of the model, the researchers used mouse cells to grow the neurons and muscles, but differences between species can affect drug screening. In the new study, they used induced pluripotent stem cells from humans to generate both the muscle cells and the neurons. After demonstrating that the system worked, they began to incorporate neurons generated from induced pluripotent stem cells from a patient with sporadic ALS, which accounts for 90 percent of all cases. “You can see that the healthy neurites are going directly to the individual myotubes and then activating them. However, the ALS neurons don’t seem to be able to connect very well,” he says. This translated to weaker muscle control: After two weeks, the muscles innervated by ALS motor neurons were generating only about one-quarter the force produced by muscles controlled by healthy neurons. This also suggested that ALS motor neurons attacked healthy skeletal muscle tissues. 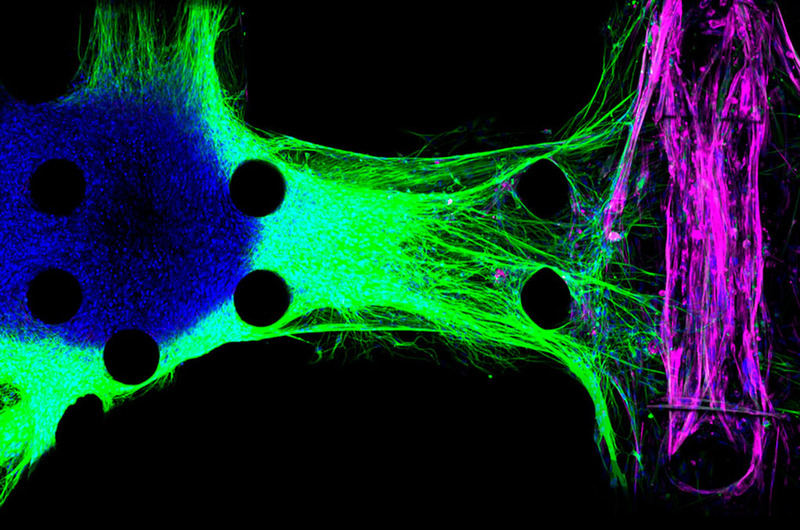 “The use of human-derived neuronal cells from ALS patients, combined with stem cell derived muscle cells — and the formation of a functional neuromuscular junction — is a major advance in the field of tissue models on a chip,” says Rashid Bashir, a professor of electrical and computer engineering and bioengineering at the University of Illinois at Urbana-Champaign, who was not involved in the research.